WOOSTER, OHIO –One of the pleasures of being the chair of the Geology Department at Wooster is that I get to go to the annual college Awards Banquet with some of our best students. 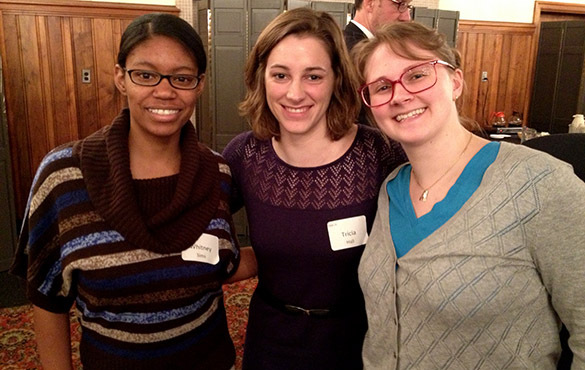 Tonight we celebrate three young women who have done especially well at Wooster. On the left is Whitney Sims (’13) of Maple Heights, Ohio. She received the Charles B. Moke Prize, which is a “field instrument or device” awarded to the graduating senior who has shown the greatest improvement during his or her college career. (Whitney’s award was a new iPad — coolest prize of the evening.) In the middle is Tricia Hall (’14) of Marion, Ohio. She won the Karl Ver Steeg Prize in Geology and Geography, which goes to the geology major who has the highest standing in the middle of the junior year. On the right is Kit Price (’13) of Ann Arbor, Michigan. Her award was the Robert W. McDowell Prize in Geology for having the highest general standing among geology majors in the junior and senior years. Congratulations to Whitney, Tricia and Kit! We are very proud of them and all our Wooster Geologists.